On the 17th of September, with no sense of control over my course work or homework, I found myself en route to campus ministry. I had been to campus ministry many times before, avoiding the snow and cold heading to and from classes. This time I was headed to campus ministry to meet with a Catholic sister. I found myself wondering how this turn of events had happened as my one direct, but decidedly feeble, link to Christianity was through my maternal Grandfather, a Lutheran minister. Armed only with my intimate knowledge of The Sound of Music and my father's stories of Catholic elementary school, I meandered down the longest way possible through Coeur d'Catherine to campus ministry. Waiting for me in the small lounge area was a petite woman with grandmother white hair. She wore a pale pink suit and was reading the campus newspaper. 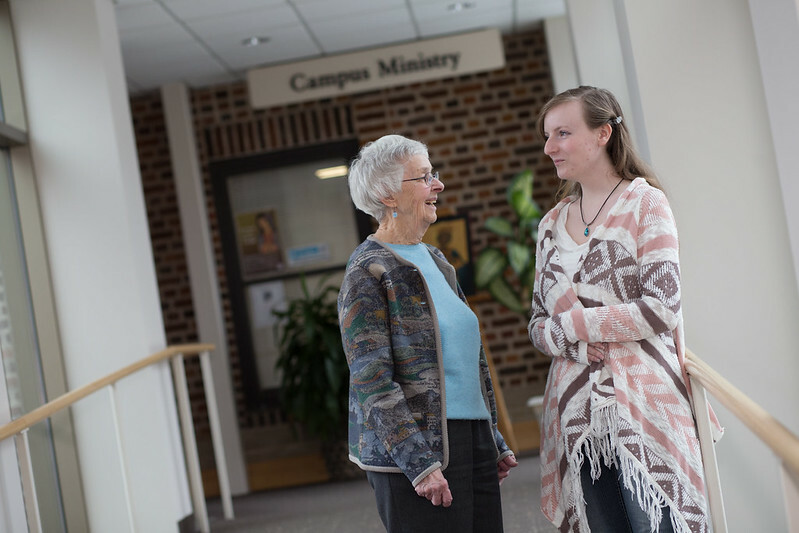 Sister Florence popped up with alarming speed for someone her age and shook my hand enthusiastically as she first introduced herself to me, and then proceeded to introduce me to everyone present in campus ministry. I followed her as introductions flew over my head, thinking, "Wait a minute, I was only prepared to remember one name today." After this flurry of extroversion, Sister Florence and I sat down in the lounge. I was struck by a sudden and calamitous thought: What does one say to a sister who has been to Palestine and back, graduated with a master's in theology from Notre Dame University, and has been president of a peace corps-type organization for the Middle East when one has absolutely no idea what even regular old lay Catholics do? So, Sister Maria certainly has her hands full with becoming governess to seven new children all at once? Thankfully, Sister Florence, as a by-product of being a sister, was determined to never feel life's awkwardness, and took up the reins of the beast known as "cross-generational conversation." I fidgeted in my chair while I tried desperately to remember what I'd supposedly learned for Communication Dynamics last semester. We talked for a while about my school life, "Oh, I go to class and then go home and study," I said, making myself sound like quite the diligent student. Sister Florence asked what I do in my free time. She asked what I do for fun. This of course immediately led to the making of a list called "Fun Things To Do Together." After a while, we decided to take a short walk outside and a small white elephant stuck his nose into the conversation as Sister Florence asked if I was religious. "Uh." I said. "I wish I knew." Because what counts as religious? One grandfather had been a minister, the other set of grandparents had be devoutly Catholic but died when I was very young. My grandmother had dabbled with esoteric views on life, and my mother exposed me to friends who were esoteric, spiritualist, vegetarian (it counts), and a number of other things. My step-aunt is working on her Rabbinical studies. And all through school I had been exposed to Christian, Muslim, and other religions both in curricula and in the student population. My best friend goes to Bethel University and cried when she first found out I didn't go to church every Sunday. Do these experiences make me religious, as experiences are supposed to make up who I am? "I'm just eclectic."